NYC, 04/15/2019, 9:30AM. 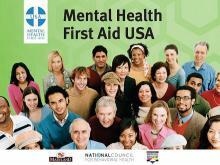 Mental Health First Aid Training. Mental Health First Aid (MHFA) is a groundbreaking public education program which introduces participants to risk factors and warning signs of mental health problems, builds understanding of their impact, and overviews common treatments. MHFA is an 8-hour certification course, which uses role-playing and simulations to demonstrate how to assess a mental health crisis; select interventions and provide initial help; and connect persons to professional, peer, social, and self-help care. The program also teaches about the risk factors and warning signs of specific illnesses like anxiety, schizophrenia, bipolar disorder, eating disorders, and addictions.